Summer may be winding down, but that doesn't mean your social schedule has to go into hibernation. August brings a flurry of street festivals, concerts and restaurant openings to a neighborhood near you. The month kicks off with four-day music festival Lollapalooza, which takes over Grant Park with headliners Arctic Monkeys, Bruno Mars, The Weeknd and Jack White. Didn't nab tickets? There are still plenty of things to do around Chicago that weekend. Then, cap off the month by laughing it off at iO's 10-day comedy festival. Here's a look at the best events and openings in August. Brad Dourif, the voice of Chucky in the Child's Play movie series, is joined by five different actors who have played Friday the 13th's masked killer Jason at this annual horror movie convention. See tributes to Pink Floyd, ZZ Top and Led Zeppelin or sit on blanket and enjoy food truck grub at this neighborhood festival in Jefferson Park. Edgewater hosts a pet parade, an ABBA cover band, ubiquitous ’80s tribute act 16 Candles and lots of local vendors at this annual party in the streets. Tens of thousands of rubber duckies are poured out of a dump truck to race down the Chicago River at this fundraiser—adopt a duck for $5 and you could win a car, a vacation or $2,500 in cash. If you've never made the journey to Springfield for the Illinois State Fair, you're missing out on fried foods, a 500-pound butter sculpture and (separately ticketed) concerts from Ludacris, 311, Foreigner and more. Fill up on encased meat creations from the likes of Byron's, Chicago's Dog House and Fatso's, then learn about the history of your favorite local dish by attending a lecture at the Speakers' Stage. 30 Cuban vendors will be serving dishes such as jibarito sandwiches, ropa vieja, lechón and tostones at this three-day fest, which also features boxing matches and performances from Cuban stars like Willy Chirino and Jerry Rivera. Antique vendors and classic cars fill six blocks of Roscoe Village at this throwback street market, where everything old is new again. Sample chicken teriyaki, Spam masubi and Hawaiian shaved ice at this Japanese cultural festival, which also features live taiko drumming and a bonsai exhibition. Drill teams, marching bands and dance squads filled Martin Luther King Drive during this annual back-to-school parade, which celebrates African-American students from throughout Chicago. Moving out of the brewery's parking lot to nearby Douglas Park, Lagunitas's annual beer-soaked bash hosts circus performers, aerialists, sideshow acts and some limited-release beers you won't find anywhere else. One of the city's largest street festivals takes over Boystown, hosting five stages of music, including a headlining performance from "Gonna Make You Sweat (Everybody Dance Now)" singer Martha Wash.
Party Noire curates this month's edition of ACTIVATE, filling an alley in the Loop with DJs, graffiti artists, an old-school dance floor and more performances and interactive elements. Mingle with a dream team of Chicago’s top chefs—including Graham Elliot, Abe Conlon and Matthias Merges—as they create unique collaboration menus for you to enjoy. Pay once, put your wallet away and enjoy bites and beverages from more than 40 restaurants, wineries and breweries. More than 150 artists flock to Rogers Park for this gigantic festival, where you can hear local bands, purchase pieces from local creators and enjoy some of the neighborhood's cuisine. Humboldt Park transforms into an outdoor tapas bar during this boozy bash, which pairs bites from local restaurants with pitchers of red wine. 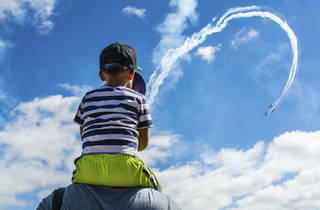 When you begin hearing jets breaking the sound barrier in the skies above Chicago, you know that the Air and Water Show has arrived. 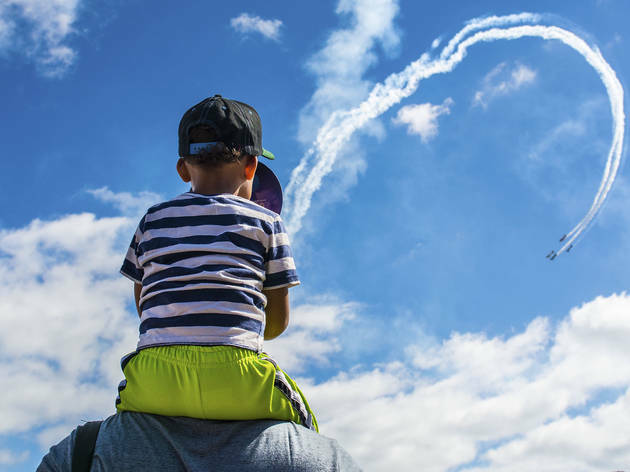 Head to North Avenue Beach to get the best views of the aerial and aquatic stunts. 30 vendors serve mouthwatering morning bites, accompanied by an open bar serving Bloody Marys and mimosa pong. The South Shore Drill Team and R&B singer Jeffery Osborne headline an afternoon of late-summer fun on the South Shore. Sebastian Stan (Bucky Barnes in Marvel's Avengers) and Dave Bautista (Drax in Guardians of the Galaxy) are just two of the famous folks you'll find among the cosplayers and piles of merch at Wizard World. Enjoy the feta, tzatziki, roasted chicken and more signature Mediterranean flavors at this two-day festival in Greektown. Twenty-five mobile eateries gather near the 606 for a weekend of snacking, soundtracked by acts like electronic producer Prefuse 73, punk rockers the Men and experimental act Palm. Swedish DJ duo Axwell Λ Ingrosso, electro-funk act Jamiroquai and sultry R&B singer-songwriter Miguel headline a weekend of hip-hop, EDM and jam bands in Union Park. Spend Labor Day weekend eating lobster flown in from the East Coast while you take in the picturesque views of the Midwest. Feast on potato pancakes, kielbasa and pierogi dance to some polka music or play a few rounds of bingo. A recreation of an African village pops up in Washington Park, where visitors will find vendors selling drums, quilts, fine art and other handmade goods. It's the biggest weekend for music (and teenagers in tank tops) in Chicago, as Grant Park hosts sets from Bruno Mars, the Weeknd, Jack White and more than 180 other acts. Graphic designer Scott Hansen combines instrumental post-rock structures with the atmosphere of trance and house music. Armed with a surplus of achingly melancholy songs, two pairs of brothers and the haunting baritone of singer Matt Berninger, the National plays a warm-up set at Metro. Making tracks that bristle with DIY enthusiasm and unfettered charisma, this expansive hip-hop collective headlines a sure-to-be-packed Lolla aftershow. The "Call Me Maybe" singer shows off her latest synth-pop anthems at this Lollapalooza aftershow. Unrelentingly self-assured and armed with a scathing sense of humor, Lizzo's high-energy hip-hop pulls no punches. The Third Man Records head honcho last performed at Metro in 2002 with the White Stripes—he'll return for an intimate gig before his Lolla set. Singer-songwriter Afie Jurvanen plays a free Millennium Park show, demonstrating his warm baritone through a collection of easy-going, R&B-inflected songs. Hip-hop's most prominent power couple brings its latest arena tour to town, stocked with fresh tunes from Bey and Jay's collaborative Everything is Love LP. It's a local two-fer in Millennium Park, as Chicago bands Whitney and NE-HI team up for an evening of jangling indie rock. Billy Corgan reunites with original band members James Iha and Jimmy Chamberlin for a three-hour arena show that focuses on the Pumpkins's ’90s output. The pop crooner takes his mopey piano balladry to the United Center for an evening that may leave you reaching for a tissue. Touring for the first time in more than three decades, two original members of ELO bring hits like "Mr. Blue Sky" and "Evil Woman" to the arena. The final free Millennium Park concert of the season welcomes the breezy melodies of local rock outfit the Sea and Cake to the stage. Canadian R&B superstar Drake joins forces with hip-hop trio Migos for an evening of chart-topping rap anthems. The Seattle rockers return to the Friendly Confines, and you're probably going to be subjected to Eddie Vedder's schmaltzy Cubs anthem, "All the Way." Chicago hip-hop blog Lyrical Lemonade brings Joey Bada$$, Vic Mensa, Trippie Redd and a long list of Soundcloud rappers to Douglas Park. Notalgic punk-rock record store Bric-a-Brac hosts its annual summer bash, headlined by legendary Detroit punk Nikki Corvette. Ravinia hosts a ’90s alt-rock team-up featuring the band that earnestly covered "I Will Survive" and goofy yet endearing pianist Ben Folds. Indie-rock stalwarts Guided by Voices and alt-country act the Old 97s headline a free, two-day block party in downtown Evanston. Dissecting his own jokes and skewering some of the most famous comedians in the business, Kindler's unique brand of stand-up is as technical as it is funny. Jet Eveleth and Scott Adsit, local podcast Hello From the Magic Tavern, the writers behind Clickhole and Comedy Central's Jordan Klepper headline iO's 10-day comedy festival. Master impressionist and former MadTV star Caliendo brings his versatile voice and hilarious routines to Zanies's Old Town outpost. See 163 prints created with handmade charcoal ink, each depicting an individual who has self-immolated in protest of the conditions in Tibet. Step inside one of Japanese artist Yayoi Kusama's famous Infinity Mirror Rooms at this new pop-up exhibition, which features installations that blend art and science. The MCA displays work from its collection that considers each artist's relationship with way they move through the world, including travel photography and pieces that explore a specific place. Considered one of the most anticipated openings of the summer, etta debuts in Bucktown with fire-baked focaccia, decadent pizzas and twists on classic cocktails. Situated just below the Chicago Brown Line stop, Good Measure brings punk-rock vibes and indulgent bar food to River North. Indiana's 3 Floyds Brewing still doesn't have a permanent bar in Chicago, but this pop-up will combine its sought-after beers with decor inspired by Egyptian art and architecture. Lettuce Entertain You's first wine bar will offer an ever-changing menu of unique pours and a collection of small plates in the former Bottlefork space. Coffee aficionados will want to fuel up at Four Letter Word's forthcoming Logan Square storefront, which serves its namesake beans and pastries from Cellar Door Provisions. Chef Matt Kerney (Longman & Eagle) introduces a new fine-dining concept to Uptown. Expect two tasting menu options—one for carnivores and another for vegetarians—as well as a robust wine list.